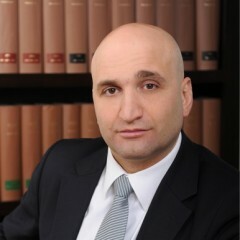 Mr Serdal Altuntas is a founding member of SANAS Law Office. He was born in Forchheim/Bavaria on 11.03.1975 and is married. After finishing grammar school at the Ehrenbürg-Gymnasium in Forchheim/Oberfranken, he enrolled for jurisprudence at the university of Halle an der Saale. Mr Altuntas continued his studies in Erlangen and Munich and graduated in 2004. He completed his judicial traineeship at the OLG/district Munich and, in 2007, passed the second state exam. Until the end of 2008, Serdal Altuntas worked as a self-employed lawyer. Already during his studies and his judicial traineeship Mr Altuntas had successfully founded several companies and had helped his wife, who is a graduated pharmacist, in establishing three pharmacies in Munich. Thus, experienced in business himself, Mr Serdal Altuntas has no difficulties in familiarizing with the concrete problems when founding a business and, therefore, in giving comprehensive advice to his clients concerning corporate and commercial law. Besides this legal field, Mr Altuntas takes care of commercial tenancy law and immigration law. Compulsory execution and debt collection are a further focus of his work with SANAS Law Office. Mr Serdal Altuntas speaks German, Turkish and English fluently. Apart from his fascination for legal practice, Mr Serdal Altuntas preserves a vivid interest in politics and international cultural aspects.